Villagers in India's Andamans and Nicobar Islands have denounced 'paltry' tsunami compensation relief they have received from the local government. One woman received a cheque of just two rupees (less than five US cents) for damage to her coconut crops. The islands' chief administrator has now conceded that "ridiculous" cheques have been sent out to tsunami victims. 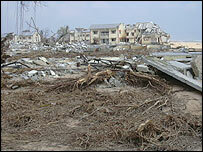 Thousands of islanders were killed in the 26 December Indian Ocean tsunami and many survivors were made homeless. 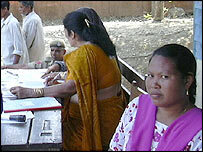 India's central government promised millions of dollars worth of aid to the Andamans after the tsunami. Scores of villagers in the worst hit Nicobar group of islands say they have been issued with cheques for small amounts of money. The BBC has seen a cheque for two rupees sent to Charity Champion, who lives in the village of Nancowrie, an island in the worst hit Nicobar group. "I lost 300 coconut and areca nut trees in the tsunami, with damage running up to 20,000 rupees ($457)," Charity told the BBC. "But even judging by the government's assessment of damage, I should have received at least five to six thousand rupees ($114-$137). "You don't pay two rupees even for a broken window pane." Her nearest bank demands a deposit of 500 rupees to open an account. She said she was in no mood to do that, just to cash in her two rupee cheque. Although Charity is the only person to receive a cheque for a single digit amount, there are scores of others who have been paid what they consider to be dismally low amounts. Daniel Yunus of Malacca in the Car Nicobar islands has received only 41 rupees (just under one US dollar) for what the government said was compensation for damage to 200 areca nut trees and 300 banana trees. "The agriculture department people in our island do not seem to have any idea of just how much a full grown plant is worth. If they knew, they would not be issuing such ridiculous compensation cheques," he said. "This is the biggest joke the administration is playing on these devastated people," said Rashid Yusuf, chief of the Tribal Youth Association in the Nicobars. "Most of them have lost everything, and after keeping them in wait for three months, the administration is paying ridiculous compensation figures." He said some tribals have refused to accept compensation. Andaman's top environmentalist Samir Acharya also argues that the damage assessment is inaccurate. "The Nicobaris were the worst hit by the tsunami. Now they are worst affected by an indolent bureaucracy," said Mr Acharya . A spokesman for the islands' agriculture department, who did not wish to be named, told the BBC the compensation paid was "based on objective reality." Another member of the agricultural department blamed the problem on the islands' revenue officials. 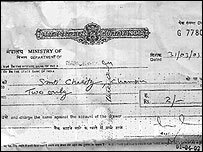 Later on Thursday the islands' chief administrator, Ram Kapse admitted that "ridiculous compensation cheques" had been sent out. "This was done as per our rules on the basis of the extent of damage to the crop and the land," Mr Kapse said. "We have another package coming and we will pay more money to the needy." The Indian central government announced a multi-million dollar rehabilitation package for those affected by the tsunami in the Andaman and Nicobar Islands after the disaster. Almost one-fifth of that amount was earmarked for compensation to agriculturists whose farms or plantations were ravaged by the tsunami. Environmentalists also argue that the administration is way behind schedule in providing 10,000 temporary housing shelters to the tsunami victims. More than 3,000 people were confirmed dead on the archipelago during the tsunami, and official figures say that more than 5,000 were missing. But aid agencies and local groups say the number of dead or missing is at least two times higher.